The question of “how to write a script” is difficult to answer outright, in the same way that “how to build a car” is. Both are complex, made of several parts that work together in order to achieve a unified effect. “How to build a sportscar” and “how to build a hatchback” are similar to a degree – similar in their overall principles. But at some point, the detail of one’s construction will diverge from the other because a sports car and a hatchback have different purposes requiring differences in their construction. “How to write an emotional script” and “How to write a spokesperson script” are different in this way. They both adhere to many of the same principles, but in their detail, they have different techniques owing to differing objectives. Of course, the primary difference between a script and any other written communications document is that a script is never actually read by its audience. A written communications document is much easier to write because its meaning and message are self-contained and fully within your control. In the case of video, the script is only the first step in a longer and more complex creative process, often involving multiple people with different skills. Simply put, the script is not the finished product; it is a blueprint for a finished product – and that is the first principle of screenwriting. This may seem like an obvious point, but its importance cannot be overstated. More than anything, this fact about scripts is the thing that people tend to overlook, and which generally lead to problems. Above all else, keep in mind that when you’re writing a script, you’re writing instructions for other people to interpret. So what is the best way to create instructions for a video? First, you must choose a format for your script. Your first instinct might be to write dialogue in the usual paragraph form and then maybe write a few visual ideas in the margins or in parentheses. But the simplest way of writing a script is to use the “Audio/Visual” format. You can think of a video as two separate narratives: one audio, and one visual. Of course, these two narratives need to work together, so this should be indicated in the script. To do that, it’s best to format your script as a table with two vertical columns. Separating the writing into two columns helps the reader to visualize the video as well as read its dialogue. This is important because the visuals often enhance or supplement the spoken dialogue. Consider the following script, and note how there are visual directions that relate to the spoken dialogue. This script does a good job of separating the audio and visual elements in the script, and the dialogue uses pronouns like “this” to refer to the visual components of the video. But there is a problem here. The visual column contains a lot of visual references, but it’s not clear when these visuals should appear on screen, or even what they are. For example, is the “spokesperson speaking to camera” on screen throughout the dialogue? When does the “sales graph” appear? Does the “sales graph” remain on-screen throughout the dialogue? What does “video marketing” mean here? These must be clarified, and that’s why each column is further separated into rows, each with very specific instructions. Now both columns have been spaced out horizontally in such a way that the pace of the dialogue and the images have a clear correlation. It may seem counter to your writer’s intuition to describe things in such literal detail, but it’s important to remember that the person who is interpreting your script needs this information in order to visualize and understand it. That person may be the one approving the script, or the one executing it. In either case, they will need you to help them imagine your vision of the video. 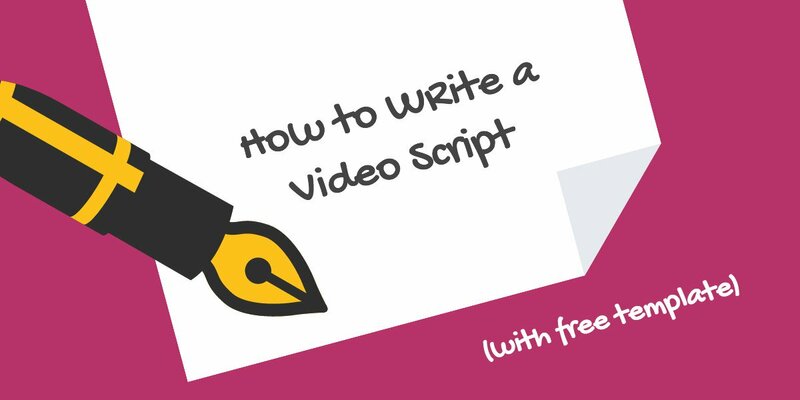 Download our free A/V script template by entering your email address below. By submitting this form, you agree to receive periodic emails from us such as additional content offers. You may unsubscribe anytime. 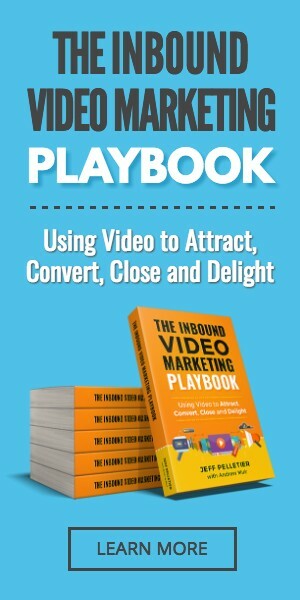 Every video is meant to be watched, and that means part of the goal is to make it watchable. In our industry, the term ‘engagement’ is used to describe a video’s ability to retain its audience’s attention. Of course, the responsibility for this belongs, at least in part, to the script. That’s why there are some situations in which it makes sense to script a video’s structure, even if you’re not scripting its specific dialogue. The goal in this case is to do everything you can to ensure that the video follows a purposeful narrative, and thus engages its audience. Let’s imagine that you want to create a video that features a short end-of-year message from your company’s CEO. You’ve decided that you don’t want the video to be a scripted presentation; you’ve determined that a more authentic or casual tone is better for this video’s message. So you decide to write some interview questions. In this situation, it would nice to know how the edit is going to be organized. What will his opening statement be ABOUT? What key messages do you need to cover? How should the video conclude? How will you keep the viewer’s attention? This is where a Structure Script can be handy. A Structure Script can be thought of as a kind of outline. Its purpose is not to indicate the precise words that will be used in the video, but rather to give a sense of the overall organization of ideas. It’s still useful to use the A/V format, but the content of the script is less specific. As you can see, this script does not precisely indicate what Dave (the CEO) is going to say – at least not verbatim. But it does indicate what his overall message will be, and more importantly, it indicates the order in which these messages will be organized. This Structure Script is a handy reference, not only for the editor but also for the individual who is writing and/or conducting the interview with Dave. For example, knowing that Dave is going to open by “reflecting on the success of the last year”, the interviewer knows that this answer has to sound introductory in its nature. It is the first thing the viewer will see and hear, so it should lead in. It would be difficult to open the video with a line like “Yes I agree we had a good year”. What you need is a line like “When I think back on the last year, I’m amazed at how well we did”. These subtle differences in tone and delivery are often what makes the difference between a video that is watchable and purpose-driven, and one that feels cobbled together and unmotivated. As with any communications piece, a coherent outline can make a world of difference. In the best case scenario, you come away from the interview shoot with a lot of useful footage and dialogue to work with – enough to construct your message in the editing suite. The worst case scenario is that you fail to elicit all the necessary material, resulting in a choppy or incomplete edit that fails to achieve the video’s objectives. How can you achieve this best case scenario? The answer is partly in how you script the interview questions. Our company is the national leader in fleet management. We are currently introducing a new suite of solutions. Our new suite of solutions is designed to increase mine efficiency, and reduce operational costs. These ‘target messages’ next need to be transformed into questions. But be careful: not every type of question is the same. Some will elicit the wrong kind of answer. Here is the wrong way to phrase the question. Is our company the national leader in fleet management? The main problem with this phrasing is that it is a yes or no question. If you pose this question to your interviewee, you are likely to get an answer that sounds something like “Yes, it sure is!”. This answer is useless because your audience will not hear the question; the answer is meaningless, and cannot be used when it comes time to edit your interview footage into a video. Our company has been quite successful nationally. Can you talk about that success? In this case, the speaker will have no alternative but to search within for evidence and examples to support the answer, and assuming the speaker has the desired knowledge, this message will likely emerge naturally and authentically in the dialogue. This is the goal of an interview. Tell me about our current and future product line-up. What is the purpose of the new suite of solutions? One thing to note is that your questions might have two or more desired responses. In this case, it’s a good idea to separate these messages in your interview questions. This will help you to make sure you’ve covered every message during the interview. If you’re lucky, the speaker will address both points in one answer. However, a good interviewer never leaves things up to chance. Once these messages are all covered, don’t forget the “housekeeping” questions. In almost every case, you’ll want to ask. Please introduce yourself and describe your role in the company. What are your thoughts overall on what we’ve discussed? Do you have anything you’d like to add that we haven’t talked about? And as a final note, it is generally helpful to arrange your questions in the order in which they are most logical. For example, if the video’s purpose is to explain the new suite of solutions, ask what that solution is before you ask what its benefits are. For animated videos or those involving complicated visual sequences to be filmed, most will develop a storyboard. This may be just a series of very rough sketches or more complete sequences of animation (called animatics) which help to show the video’s visual style and progression. This pre-visualization process helps to establish the look of the video, and in more complex projects, to plot out its narrative and plan transitions between scenes. A storyboard can be extremely important, not only for sharing one’s vision for a project with key stakeholders, but also as a reference for film crews, editors, and animators—anyone who is involved in the project throughout each stage of production. Unfortunately, developing clear and useful storyboards is almost as much of an artform as filmmaking is itself. Professional storyboard artists are available for hire, but if you find yourself having trouble communicating your vision for a video, it may be a sign that your project is too complicated not to leave entirely to the professionals. Download our free storyboard template by entering your email address below. Vimeo Basic, Vimeo Plus or Vimeo Pro: Which is Right for Your Business?